Democrats are endorsing striking teachers. That doesn’t mean the party’s abandoning its education agenda, but it does mean that the working class is making itself harder to ignore. When Chicago teachers struck in 2012, the entire liberal political class seemed against them, as Corey Robin noted last year. The strike was provoked by a Democratic power player, Mayor Rahm Emanuel, and liberal pundits lined up to tut-tut about how a strike waged for “the schools Chicago’s children deserve” was actually hurting Chicago’s children. Back then, Bernie’s support for striking teachers made him an outlier on the national political stage. But now, things have changed. In 2018, a strike wave swept through West Virginia, Oklahoma, Kentucky, and Arizona, highlighting the dismal state of public schools in those states. Teachers in Baton Rouge, Louisiana voted on a one-day strike to protest tax exemptions for gas giant ExxonMobil while schools faced budget cuts. Teachers struck in Washington and Colorado. Chicago charter school teachers walked off the job, the first such strike in the nation. Oakland teachers, in a city and state under firm Democratic Party control, started getting restless. Robin wondered after the red-state strikes last year if the change in rhetoric would carry over to a blue-state teachers strike. With the Los Angeles teachers strike kicking off this week after a year of militant teacher actions throughout the country that the public largely supported, we have an answer: liberal politicians with close ties to the Democratic establishment are now publicly supporting Los Angeles’s striking teachers. Bernie supported the strike, of course, as did Alexandria Ocasio-Cortez. (Ocasio-Cortez even took an extra step, naming school privatization as a primary source of teachers’ frustration.) But this time they weren’t alone. The district, of course, is sitting on a $1.86 billion reserve. And UTLA president Alex Caputo-Pearl, at a union rally Monday, noted the irony of the strikers teaching “in the richest country in the world, in the richest state in the country, in a state as blue as it can be, and in a city rife with millionaires, where teachers have to go on strike to get the basics for our students.” Teachers clearly aren’t the ones who need a lecture about living inside their means. This week, however, Garcetti’s spine stiffened slightly. “I’m immensely proud of Los Angeles’s teachers today for standing up for what I believe is a righteous cause,” he said. Garcetti’s shift should be viewed with strong suspicion, of course. He’s given some praise to the union and showed up at a picket line, but most of his rhetoric has been mealy mouthed, and he (and most other Democrats) don’t mention critical strike issues like charter schools. Still, his expression of approval is a slap in the face to Garcetti’s gala wingman and occasional donor Eli Broad, a determined school privatizer and one of UTLA’s archenemies. The mayor’s willingness to jeopardize that lucrative relationship is a sign of the immense power that teachers can wield when they withhold their labor. Then there’s Kamala Harris, who until recently had mostly confined her education advocacy to fighting absenteeism and truancy, in one case by championing a law that threatened the parents of absent children with a $2,000 fine. Despite her most recent campaign receiving multiple donations from Eli Broad’s foundation, Harris came out swinging for the Los Angeles teachers on Monday. This decision to cross the billionaire California Democratic Party funders who are hell-bent on privatizing Los Angeles schools demonstrates just how successful the striking teachers have been in influencing party insiders’ calculus. The DNC is the official governing apparatus of a party that receives massive funding from charter school interests. Austin Beutner, the charter-bankrolled Los Angeles school superintendent and the teachers’ number-one antagonist in this fight, is a major DNC donor. In 2012, the year of the Chicago Teachers Union’s historic strike, the DNC hosted a screening of a film by Michelle Rhee, the leader of the “education reform” movement and a militant opponent of teachers’ unions. While Perez himself hasn’t voiced strong education opinions in the past, this is his milieu. He was a cabinet member in Obama’s administration, which provided cover to the school privatization movement intent on breaking teachers’ unions and lowering taxes for the rich. Perez made regular appearances with Arne Duncan, Obama’s Secretary of Education, who championed school closings, charter proliferation, and negative incentives for teachers. 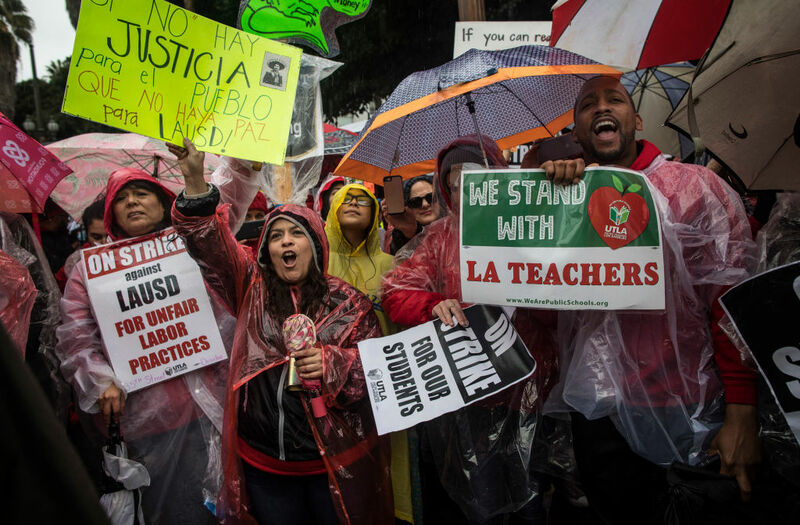 “Los Angeles teachers are fighting for the children they teach to have the resources they need to achieve and flourish,” Perez said on the day the strike began. It was astonishing to see a representative of the party cadre that was recently openly enamored of corporate education “solutions” now explicitly backing teachers who oppose those solutions — even if he didn’t have the guts to make the connection to his former boss’s “education reform” initiatives. Just a few years ago, there was no question that establishment Democrats would side with charter schools and bought-off district officials over teachers and their unions. But such people pay close attention to which way the wind is blowing. Democrats’ calculus has changed: they must make concessions to striking teachers, even if they’re striking in Democratic territory and even if that means crossing their donors. For party elites to publicly side with the teachers in this conflict, there must be a mighty wind blowing indeed. Still, even a few establishment types paying homage to striking teachers is an enormous departure from when all of liberaldom scolded striking Chicago teachers for their selfishness and unreasonableness a few years ago. Mass strikes have disrupted that dynamic. Strikes transform ordinary working-class people into a powerful social force that can’t be ignored. They do this by halting the normal functioning of society, exposing the fundamental importance of workers’ labor, and creating urgent crises to which lawmakers must respond. They can also raise popular political and class consciousness — especially strikes in institutions like schools, which are integral to many people’s daily lives — making it harder to buy working-class people’s votes with money from self-interested billionaires. We shouldn’t take the Democratic Party’s growing support for striking teachers at face value. There is still a strong pro-privatization and pro-austerity strain in the party, and it’s easier to tweet support for striking teachers than do battle with the wealthy forces that pushed those teachers to the picket line. But we should see this new willingness to publicly support striking teachers as a good sign. It is evidence that the balance of class forces in the country is changing, and that working people are making themselves harder for corporate politicians to ignore. A storm is brewing, and the winds are making landfall. Meagan Day is a staff writer at Jacobin . Micah Uetricht is the managing editor of Jacobin. He is the author of Strike for America: Chicago Teachers Against Austerity.